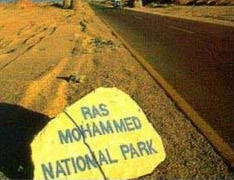 National Parks in Egypt, frequently referred to as protected areas, are for the most part a relatively new, but rapidly growing development. Though Ras Mohamed, located on the very southern tip of the Sinai has is a relatively older park, many of the others have been added only in the last few years. Some of Egypt's national parks are very remote and receive very few visitors, while others, such as that of St. Catherine's, receive many tourists who may not even know that they have visited one of Egypt's national parks. Some of the parks may be readily visited, while others will require special permission. Egyptian national parks may be found from the upper tip of Egypt down to its southern most border. They are very diverse, ranging from mountainous areas in the Sinai, underwater regions, desert areas and Nile Islands. Some of them, especially the Elba Protected area, differ from any other region of Egypt. It can be expected that more Protected Areas will be established in Egypt, but the current variety of these parks may provide interesting side trips to the causal tourists, and will be of extreme interest to nature lovers of all ages. They actually do not constitute a new type of tourism, for there have been a few visitors exploring these regions for many years, particularly the birding enthusiasts. What they provide to others is a bit more variety in a land that invites the world to see its antiquities and culture of all periods, and visit its wonderful sea resorts along the mainland coast and in the Sinai.